For the second time in a month, a guitarist's worst nightmare occurred: the house amp that I was relying on to get me thru the gig died after a few songs. Ironically, it worked perfectly fine for a friend the week in between my two follies, lending a false sense of security to me after the first debacle. I should've learned my lesson and planned for backup, but alas, there I was, going straight into the PA system with nothing but a Pedaltrain Nano+ between my Strat and DI box. Fortunately, it helps a lot to have a Fulltone Plimsoul and Strymon Flint on that Nano; the Plimsoul does the compressed amp-in-a-box thing pretty damn well (I'd have been screwed with only a fuzz or boost that rely on a good amp to do their thing), and a touch of spring verb from the Strymon gave my guitar some depth in the flat, fake, plastic-y world of DI. All things considered, it could've been much worse, and actually sounded better than I ever would have imagined. Our screaming crowd (of about two dozen) didn't seem to mind... but it still bugged me. Vowing to never let this happen again, I began to weigh my options, and digital modeling certainly would not be one of them (unless Kemper creates a pocket-sized Profiler for under a grand someday). Something gigbag-friendly would need to do the trick; a cabinet simulator like the H&K Redbox came to mind, as did the old-fashioned SansAmp pedal, but I felt there had to be something better out there. With that in mind, I visited the Tech 21 NYC website to check out their latest offerings; a local company, based out of Clifton, NJ, I've long been a fan of their Bassdriver DI, and the PSA-1 rackmount unit was a studio favorite for mangling vocals and drum loops in my recording sessions. I also like the fact that they keep their amp simulation and overdrive circuits analog, with more of a natural feel than many digital modelers have. Knowing their lineup had expanded to feature many specialty products since my first experiences with the Sansamp Classic and GT2 boxes two decades ago, I didn't think it was asking too much to find a cleaner, Fender-style preamp pedal for the blues, maybe even with a switchable overdrive or boost. That was exactly when I came across something that I recognized from a couple of friends' rigs, the Fly Rig 5. Pretty colors! But really, great to see on a dark stage. Just last month, my friend and brilliant guitarist Mark Cocheo demoed his new Fly Rig 5 on a Facebook Live post, and although he was using it as an effects pedal thru an amplifier, I thought it sounded great (though with hands and talent like Mark, MOST gear sounds pretty great). Then, literally a week after that, I saw our mutual friend Coyote Anderson playing a gig on Bourbon Street in New Orleans, and he was using a Fly Rig, also as an effects unit for overdrive and delay. After asking him about it, he said it was literally the only "amp" he traveled with for the past two years since it's release, including a tour of Europe. With the glowing recommendation of two of the best players I know, I had to check it out, and was not disappointed. First impressions upon receiving the package: how small and light it is! Seriously, it's the size of two foot-long rulers stacked atop each other, about 12" long and 2" wide. Weighs practically nothing, yet still feels very sturdy. In addition to the front pocket of my Mono M80, this thing fits perfectly alongside the guitar headlock (stuff a rag or cloth underneath to protect the guitar from any dings). Powering it up, the illuminated knobs are very easy to see on a dark stage, and indicate which sections of the pedal are engaged. Footswitches are incredibly high quality and silent, no audible pops whatsoever. I began with the middle Sansamp section, and quickly found a wide range of usable tones, similar to the Tech 21 Blonde character pedal. Although this section can get pretty dirty in a vintage Tweed style, I found the Drive worked best from just past High Noon to about 3 o'clock, giving the otherwise clean tone some attitude and balls, similar to my Princeton Reverb when cranked up. It sounds fantastic as a preamp for my little Champion 600, as demonstrated below, and the simple one-knob Reverb is a nice touch. This will be my base tone to build upon. Adding the first footswitch, Boost, to this Sansamp setting took me to instant SRV-land with my Strat, but caution: this boost is powerful! Anything beyond 12 o'clock seemed to overload the Sansamp section, but keeping it around 10-11 worked a charm. Dialing in the Plexi overdrive took a little time, as the controls are very reactive to the Sansamp settings; it takes some balancing of the Drive and Level to find a copacetic pairing, as well as the tone control, which can get a little harsh depending on the Sansamp's Hi setting. 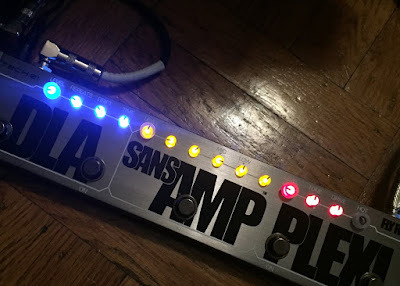 I prefer keeping the Sansamp brighter and Plexi darker, that way the extra gain doesn't take your head off; a solid dose of Mids from the Sansamp fills out the Plexi very nicely, too. A/B'd with the Plimsoul, both feeding into the Sansamp, it got pretty close, but I'd have to give preference to the Fulltone (no shock there, as it's been a favorite of mine for some time). Overall, the Plexi is a very usable overdrive, particularly for classic rock and blues playing. The Boost also adds a nice smooth compression and fullness to single-note lead lines, creating a three-stage cascading gain front end that will cover most bases just fine. The DLA section is a lot of fun, adding a vintage tape echo-style delay to the mix complete with a Tap Tempo footswitch and Drift control to dial in tape-style modulation. Although the delay is digital, it's processed in parallel to the main analog signal, and blended in courtesy of the Level knob. While not as warm as an analog delay, it's on par with any digital delay in the same price range, and excellent for anything from short slapback to longer Gilmour-style quarter notes. Using it live for the first time this past Friday night at Pinks in NYC's East Village, it took about an hour to get a feel for it through the house PA... eventually I lowered the SansAmp section output level and boosted the signal on the mixing board to prevent overloading. After that, I was comfortable with both the clean and overdriven tones, had a lot of fun with the tap-tempo delay, and had a great gig. At one point late in the night, our friend Lawrence Coleman III from the band Eve To Adam jumped in for a tune, so I was able to stand back and listen to the tone as an audience member, and was very impressed! The next night, I took it to another gig along with my Princeton Reverb as a backup; it wasn't needed, but I like the insurance policy it provides in case the Princeton takes a bump on the Cross Bronx the wrong way. Overall, the Fly Rig 5 is a much greater value than the sum of it's parts, and costs far less than purchasing each individual item from the Tech 21 catalog. Sure, you could spend much more on boutique standalone overdrives and delays, but without the SansAmp circuit in the middle, you'd be in the same boat I was, just trying not to sink. If you need a quality backup rig on a budget, or just a small, lightweight, convenient pedalboard for gigging, look no further. While this may sound like a paid endorsement for Tech 21, I promise it's not... my point is to convey the importance of a solid backup plan, and cover all the situations you may encounter as a gigging musician. You may prefer a Line6 or Digitech product for great versatility, something unique like the EHX 44 Magnum, or even a small spare amp if transportation isn't a problem. Preparedness breeds confidence, and confidence leads to great gigs, in my personal experience. It's like Viagra for your guitar; always be ready. as a guitarist myself, and an avid believer in that amplifiers never really do the trick, for years tryed to get great sounds out of just putting pedals together. one day i got a Fly rig 5 and wound up putting my other pedals away. no longer needed. now i use just 1 pedal and that's the fly rig 5 from Tech 21 NYC.